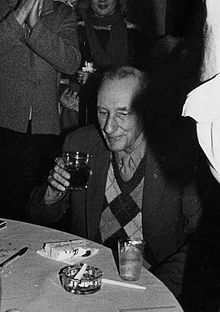 William S. Burroughs at his 69th birthday in 1983. William Seward Burroughs (February 5, 1914 – August 2, 1997) was an American writer. He was a contemporary and friend of writers Allen Ginsberg and Jack Kerouac. Burroughs was a member of the family who owned the Burroughs Cash Register Company. A family trust paid him an income, so he did not have to work a regular job. Sometimes he lived in Mexico and other countries, because he could live there in more luxury than in the United States. One favorite apartment he had in New York City was a windowless basement, nicknamed "Bill's Bunker" by his friends. Many of them were emerging writers and artists. Burroughs told interesting, colorful stories, but did not think he could be a writer. This changed as he came to terms with tragedy; he had killed his common law wife Joan, in an accident when they were both drunk. Burroughs began to write to work through his grief and feelings of guilt. He also abused drugs, including heroin, and it affected his writing. His first novel, Naked Lunch, was a surreal work. Besides writing, Burroughs also recorded spoken word and musical works. One of his works paired him with musician Kurt Cobain. Burroughs died of a heart attack. This page was last changed on 1 July 2016, at 07:33.